We got word today that we lost an old friend. Judge Nix addresses the crowd at the 1998 SpokesnFolks Parade and Festival. We knew Edmund Nix as a municipal judge, a lawyer, and the father of one of our good friends. Before we knew him, he was a federal prosecutor and a Democratic congressional candidate, among other things. RoZ and I first met Judge Nix in the courtroom, on separate occasions shortly after we moved into the area. Even though he found both of us guilty, that didn’t stop us from becoming friends. We won’t talk about my case, but RoZ’s has a fun backstory. As the accused and their comrades in the gallery approached to greet each other, one activist exclaimed in his flamboyant voice, “I don’t believe it! He sentenced you to be ACTIVISTS!” We heard the word “parade” in the judge’s list of suggestions and latched onto it. So on a rainy Saturday in September, 150 people marched in the first SpokesnFolks Parade (which always included a festival in the park afterwards), and Judge Nix declared satisfaction that the sentence he’d handed down was served. 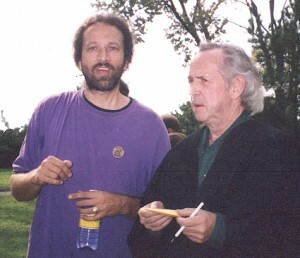 Obbie and Judge Nix confer on rewarding prizes at the 1998 SpokesnFolks Parade and Festival. Over the years we got to visit with the judge quite a few times. He knew that he could call me if he ever needed to talk to a computer guy, and we knew that we could call him if one of us ever needed to talk to a lawyer. Fortunately, we stayed out of trouble so he probably got the better deal out of that arrangement, though he did help us with some routine personal legal paperwork. 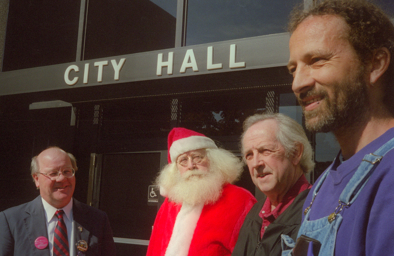 Mayor Medinger, Santa Clause (Earl Grunke), Judge Nix, and Obbie Z at the press conference announcing plans for the 1999 SpokesnFolks Parade and Festival. In 1961 [mobster Carl] Caputo was indicted for income tax evasion. He had reported income totaling $721.56 and had actually earned $31,000. This garnered him a 30-day jail sentence and two years of probation. U.S. attorney Edmund Nix had prosecuted Caputo. Ironically, Nix had once worked in a tavern owned by Caputo and was paying his way through Wisconsin-Madison Law School as a bartender. This entry was posted in Bicycling, Community, Stories. Bookmark the permalink.